Forget dry and dutiful; these whole-wheat muffins are incredibly moist. The trick is heating the carrots and raisins in water, which softens them nicely before they're added to the flour mixture. Preheat oven to 375°. Put sugar, butter, carrots, raisins, salt, spices, and 1 1/3 cups water in a medium saucepan. Heat over high heat, stirring occasionally, just until mixture comes to a boil. Whisk flours, baking powder, and baking soda together in a medium bowl. Pour in warm carrot mixture. Stir to combine, but do not overmix. Spoon mixture into greased muffin cups. Bake until browned and a toothpick inserted into a muffin comes out clean, about 15 minutes. Let cool on a rack. 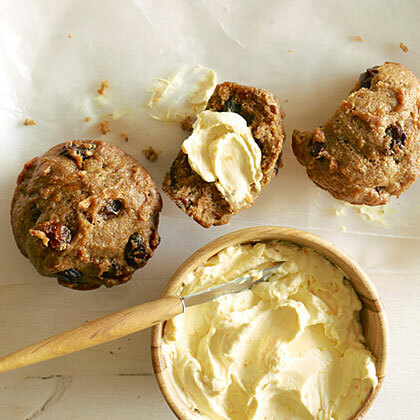 Blend cream cheese with zest and serve with muffins.